Beam is the simplest, most common and most important supporting structure member of anybody like buildings, bridges and vehicles. Beams provide support to the structures by resisting against the forces which are applied on that structure. Forces applied on beam try to bend the beam and produce deflection in its shape. Deflection produce in beam depends on its shape, material and size. There are many different types of beam based on their end supports and shapes. Timber is processes wood that’s shaped like a plank or beam and they are used in construction of different structures like houses, bridges and vehicles. Second moment of inertia is a geometric property of anybody which depends on its shape and size and defines the resisting ability of body when an external force is applied on that body. Bending of timber beam to check the deflection of beam involves applying load on timber beam. 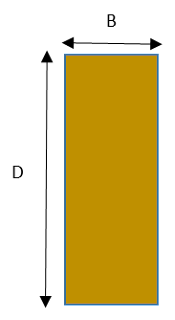 Load is applied in this experiment with the help of weights which are added on hander attached to the beam. Beam which is made of timber is purchased from market which can have defects like crakes which are invisible from outside. When load is applied to the beam crakes may lead to quick failure of beam much before it is expected. Sudden failure of beam can cause damage to students performing the experiment. This can be avoided by simply using the safety precautions like applying load slowly and gradually. Beam of timber beam and plank was done by following the procedure mention below. 1. 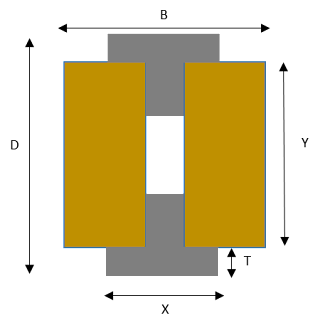 First step of this experiment if to setup the apparatus which involve placing the apparatus on horizontal place and attaching beam on it. Both ends of beam will be fixed on opposite ends of the apparatus (beam should be kept straight and horizontal). 2. Second step is to inspect the apparatus for any kind of error like zero error. Necessary work should be done in order to remove the present error before starting the experiment. 3. Third step is to add weight on beam hanger slowly and gradually. Starting from 0.5 KN increase the load 0.5 KN every time until beam brakes. As mention in theory section that deflection of beam depends on the size and shape of beam, the graphs made between deflection and load for beam and plank experimentally proves that theory. According graph between the displacement and load for plank show very small increase in displacement when load is increase but after 3 KN the displacement increased rapidly from 9 to 13 mm whereas the displacement of beam increase very gradually when load applied on it increased. Comparing the deflection of both plank and beam shows that to reach the highest value of 13 mm deflection plank takes 4 KN of load whereas beam takes about 9 KN of load which shows that beam has much more resistance against deflection as compared to plank. This is due to the fact that the second moment of inertia of beam is much more than that of plank due to which it deflection is much less than that of plank. 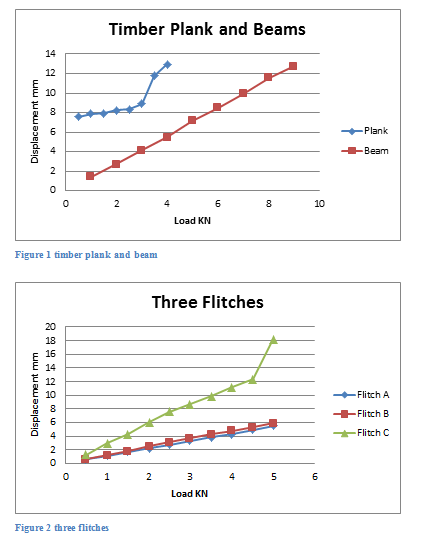 Graph made between displacement and load for three different flitch shapes show that shapes and size does effect the deflection of flitch. According to graph all shapes starts from same point but as the load increase from 0 to 1 KN the deflection made by shape C is much more as compared to shape A and B. Deflection made by shape A and B is almost the same as there is also almost same. As the load increase further till 5 KN the displacement made by shape C reaches maximum of 18 mm whereas for shape A and B it is only 6 mm. 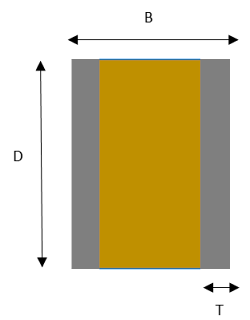 this show that shape A and B has much more second moment of inertia as compared to shape C.
Experiment has been performed to find the effect of shape of timber on the bending of the timber and according to the results obtain it can be said that the deflection of timber does depends on the size and shape of the timber. 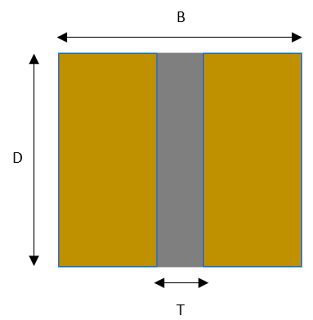 Comparison between plank and beam shows that beam has much ore resistance against deflection as compared to plank and comparison between different flitch shapes show that shape and size does effect the deflection.